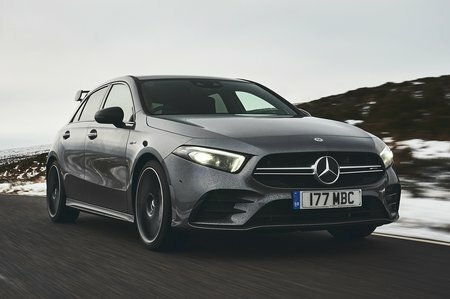 Mercedes-AMG A35 Performance, Engine, Ride, Handling | What Car? 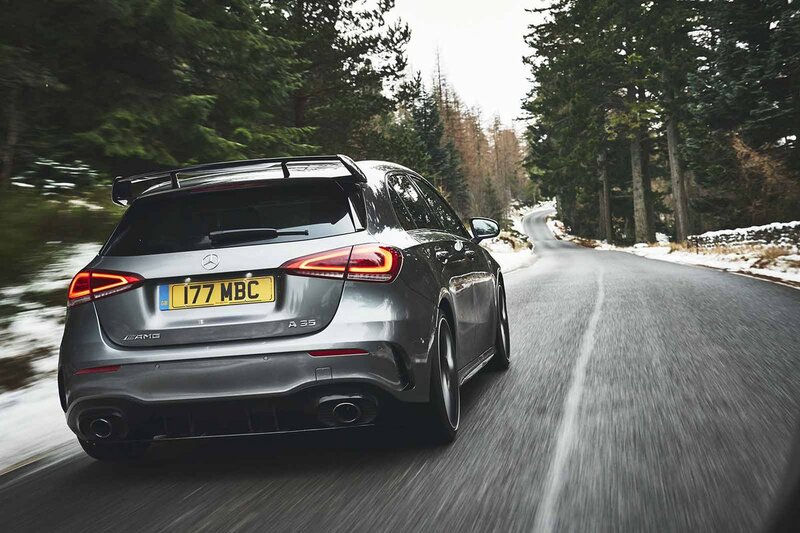 If 302bhp in a relatively small hatchback sounds like a potent combination, you’d be right. Even on cold, wet roads, the A35’s claimed 0-62mph time of just 4.7sec is never in doubt. Even out of first-gear hairpin bends, the A35 simply hooks up and goes, the four-wheel drive system putting all that power to the ground without a hint of wheelspin. However, once you get onto some quicker, more open roads, it soon becomes apparent that the A35 isn’t quite as effortlessly fast as you might first expect. Where rivals such as the S3 and M140i feel pretty rapid even low down in the rev range, the A35’s engine needs to be revved pretty hard to get the most from it, with peak power coming in at a relatively high 5800rpm. That means you have to drive it a bit like an old-school hot hatch, revving the crackers off it at every opportunity. Now, this wouldn’t be frustrating if that top-end power unlocked a playful and agile chassis, but unfortunately that’s not quite the case. You see, although the A35 has accurate (if numb) steering, fantastic body control and a keen front end, once you really up the pace you find that its chassis is set up to push wide at the front when the limit of adhesion is finally reached – and that’s even when you select the looser AMG Sport stability control mode, which theoretically makes the four-wheel drive system keener to send power rearwards. Granted, with its neutral, predictable balance, this is a car that’ll carry huge pace across country regardless of what the weather is doing, but in terms of pure enjoyment, you’d get far more from the cheaper Honda Civic Type R. Put simply, that car puts you in the centre of the action, whereas the A35 feels a bit more remote, never really involving you in the process of driving. And while we’re nit-picking, despite a few cracks and pops from the exhaust when one of the sportier modes is engaged, the engine always sounds a little flat. The seven-speed dual-clutch automatic gearbox isn’t as obedient as we’d like in manual mode, either. It’s quite possible that such thrill-seeking antics are to miss the point of the A35, though. At the end of the day, the A45 is the bonkers adrenaline pump, while the A35 feels more like a premium hatchback that's perfectly usable every day yet is capable of serious cross-country speed without ever troubling your ticker too hard. Leave the car in Comfort driving mode and the engine settles into a distant hum while you’re cruising, the gearbox switches between ratios smoothly and the ride is perfectly comfortable enough to live with, only crashing over the most vicious of bumps, even on big wheels and non-adaptive suspension.